Ceramic is kiln-fired clay that has been baked for beauty and durability. This tile is known and loved for its elegant appeal. Just the presence of ceramic tile in your home is enough to raise your property value. This tile is the softest of the three, which means it is easy to cut and install. Ceramic floor tile carries the smallest price tag as well, but offers big benefits. Because it is water-resistant, it is well suited to rooms with high humidity. 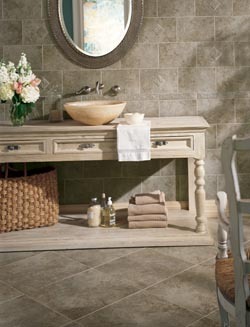 However, ceramic tile looks beautiful in any room in your home. Our showroom carries the top brand names of tile, which include Star Values™ and Floorcraft™. Our customers select porcelain tile for its modern, streamlined look. Because of this, porcelain is suitable for any decorating style. This type of tile is priced in the middle range between ceramic and slate. Porcelain is dense with a very low water absorption rate. This is one of the reasons you commonly see this type of tile in basements, bathrooms and bedrooms. Slate tile is made from pieces of natural stone. As you would expect, it is dense and heavy, making for strong and durable flooring for your home or business. Slate brings nature indoors with its earth tones of rust, gold, green, gray and blue. The variations in the rich colors of slate create a stunning impact for your guests. Slate costs more than ceramic and porcelain, but its beauty and appeal make it well worth the price. Talk with our sales and design professionals about choosing the type of tile flooring that best suits your design preferences and lifestyle requirements. Our experts have comprehensive product knowledge to share so you can make an informed decision. Professional installation is a must for tile flooring of all types. Tile is heavy and dense, so it requires strength to carry and place and experience to cut. The tiles that are placed at the edges of your floor must be cut to fit. Precision in measuring and cutting is required to maintain a finished look for your flooring. Tile that does not adhere properly will move and shift, causing it to chip and crack. The installers on our staff have many years of experience in tile flooring installation. You can count on us to install your flooring using all of our skill and knowledge. It is our job to install your tile properly so it last for many years, even decades, to come. Contact us today to help you choose the best tile flooring for your home. We are proud to serve clients in Owen Sound, Port Eglin, Wiarton, Kincardine, Hanover, Meaford, Flesherton, Tobermory, ON, and the surrounding areas.